A Miniature Sheet of stamps issued on Wednesday, 9th September to commemorate the historic landmark of Her Majesty The Queen becoming the longest reigning UK monarch. Queen Victoria’s reign of 63 years and 216 days is exceeded by Her Majesty on that day. The Miniature Sheet will comprise five stamps including a specially created purple coloured First Class Definitive (everyday stamp) which will replace the current red version for 12 months. The front of this authoritative Presentation Pack offers a wealth of photos, biographical details and archive photographs from the life and reign of Queen Elizabeth II, while the reverse explores other long-reigning British monarchs and discusses the emblems featured on the four large stamps. It also includes the historic Miniature Sheet itself. The biographical and Royal sections of the pack were written by historian Andrew Roberts, while the philatelic copy is courtesy of Douglas Muir, Senior Curator at the British Postal Museum & Archive. Dorothy Wilding’s three-quarter profile photograph of Her Majesty was one of a series taken in April 1952 and was printed on British postage stamps from 1952 until 1967. The classic Machin definitive, featuring the iconic profile of Her Majesty by sculptor Arnold Machin has been in use on definitive stamps since 1967. 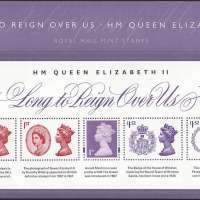 The iridescent overprint on the stamp bears the text 'Long to Reign Over Us'. This new stamp is also available in stamp books. The Badge of the House of Windsor, featuring a depiction of the Round Tower of Windsor Castle flying the Royal Standard, was approved by King George VI in Council at Buckingham Palace. for use in Commonwealth countries, The Queen’s Personal Flag was designed at Her Majesty's request in 1960. This is a gold 'E' with a crown, surrounded by a garland of roses. It symbolises the Queen's role as Head of the Commonwealth. The device from the flag appears on the stamp.